Your family is of coming off the joy of summer, back into a scheduled routine for the school year with soccer, ballet, and piano practice squeezed in-between. Chicken comes to the rescue when it’s time to make a dinner that the whole family will enjoy (even the picky eaters). The big question when it comes to everyone's favorite lean protein: How do avoid preparing it the same way over and over? You've mastered your favorite go-to chicken Parm recipe, and now it’s time to venture into new dishes and develop fresh favorites to keep in your back pocket for a moment’s notice. Here are some of our personal favorite, weeknight-friendly chicken dinners that the family will request again and again. The secret's definitely in the sauce...so is the flavor. Don't skip the last step—it brings this Instant Pot Chicken recipe all together. For a fresh pasta dish, toss bow-tie pasta with chicken, pesto, and red pepper strips. Chicken, broccolini and rice: What more could you ask for? Our top-rated Asian chicken bowl is flavorful, healthy and comes together quickly for busy weeknights. Make this top-rated chicken pasta flavored with fennel and coriander in less than 40 minutes. Start with a bottle of classic Italian marinade, a can of chicken broth, and tomato sauce and you're halfway to a creamy pasta with tender, juicy chicken for dinner tonight. Optional: You can sub skim milk for half-and-half to save calories, but the end result won't be as creamy. Making crispy, golden-brown chicken is ­possible on a weeknight if you use the oven instead of the stove-top. Enjoy the contrast between the hot cooked chicken and the tangy caper-and-lemon vinaigrette. This elegant single-skillet meal for two is deceptively easy to make. 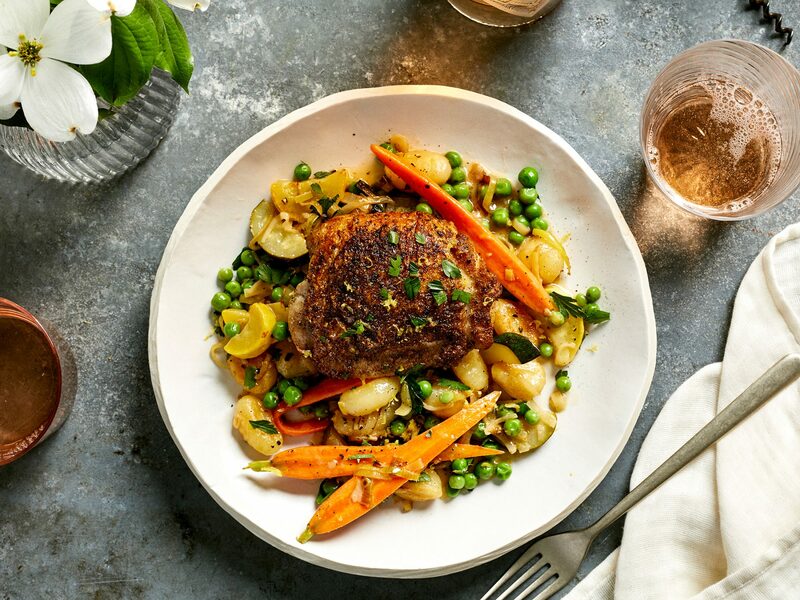 Ready in under an hour, this skillet chicken dinner includes your protein (perfectly golden-crisp chicken thighs), green veggies (peas and asparagus), a starch (baby Yukon gold potatoes), and a whole lot of vibrant flavor (hello, shallot vinaigrette). 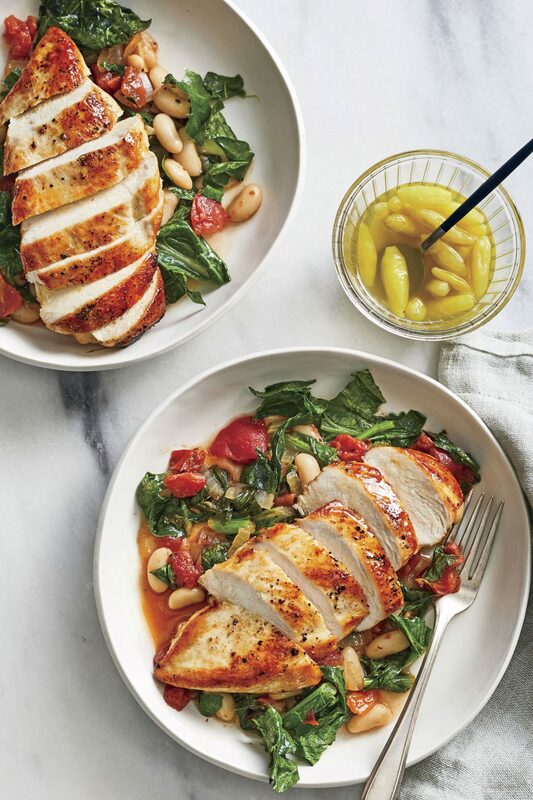 This easy weeknight chicken dinner is one you’re sure to come back to again and again. Creamy, cheesy, chicken pasta—what’s not to love? This cozy 25-minute meal from The Food Gays is sure to become your new go-to this school year. Smoked chicken, which you can pick up from your favorite barbecue restaurant, gives this soup a nice depth of flavor. Lime juice, avocado, and cilantro add a Latin accent. We adapted our simple and delicious Pressure Cooker Chicken Spaghetti recipe to be a perfect fit for your Instant Pot. It's sure to become a new weeknight favorite. The lightly spicy, fresh peach relish that accompanies these simple grilled chicken thighs adds color and a burst of vibrant flavor to create a wow-worthy summertime dish. In fact, don’t be afraid to make a double batch of this salsa, as we have no doubt you’ll be able to find plenty of delicious ways to enjoy the leftovers—even if it’s just with tortilla chips for a next-day afternoon snack. Simple to prepare and loaded with fresh, seasonal flavor, these Peach-Ginger Chicken Thighs are the perfect entree for your next casual cook-out. These mediterranean-inspired grain bowls are perfect for make-ahead meal prepping. Hearty and filled with various flavors and textures, this is the kind of packed lunch or simple dinner you’ll be satisfied with all week long. Inspired by the favorite pasta dish, this creamy Chicken Alfredo Soup comes together in no time with the help of a few store-bought shortcuts. Rotisserie chicken, frozen peas, and a jar of Alfredo sauce, which serves as the backbone of this highly comforting pot of soup, keep your hands-on prep to a minimum. This convenience factor, coupled with the fact that it’s is a guaranteed kid-pleasing recipe, makes this soup a perfect go-to for hectic weeknights. While it is undeniably luscious and satisfying, the soup is surprisingly not overly heavy. 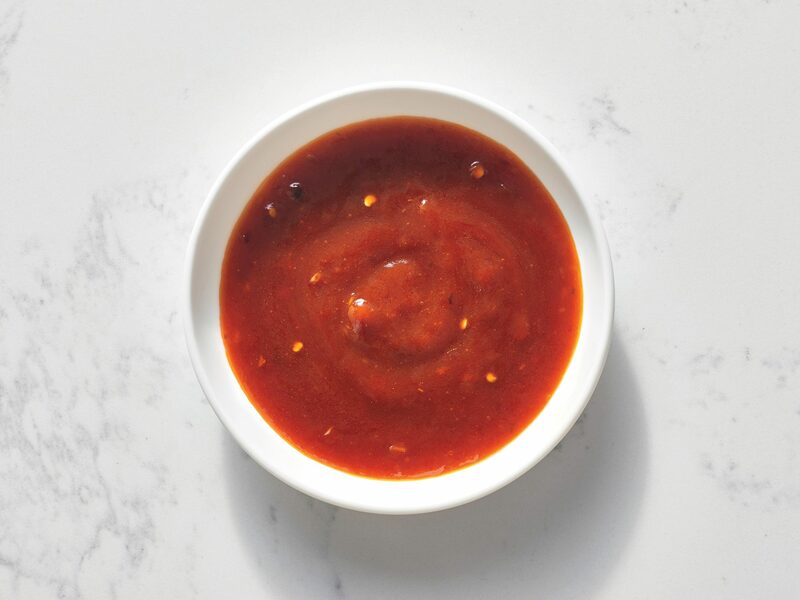 We used Gia Russa brand sauce, but feel free to use your own favorite. Served with a crusty bread, a green salad, and a glass of white wine, this quick and easy soup makes for an outstanding dinner on chilly nights. 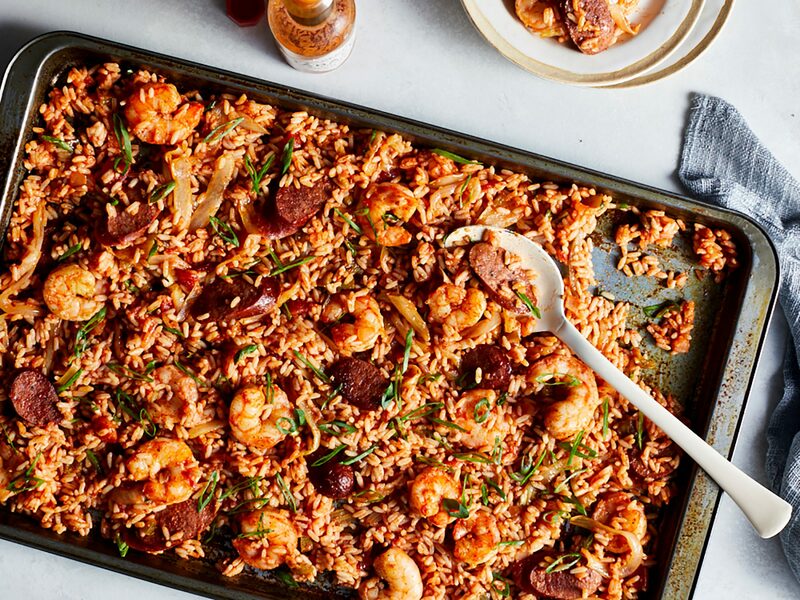 Go ahead and flag this recipe--it's sure to become a family favorite. For convenience, we call for precooked wild rice; if you can't find it, you can substitute 2 cups of your own cooked wild rice or a package of precooked brown rice. 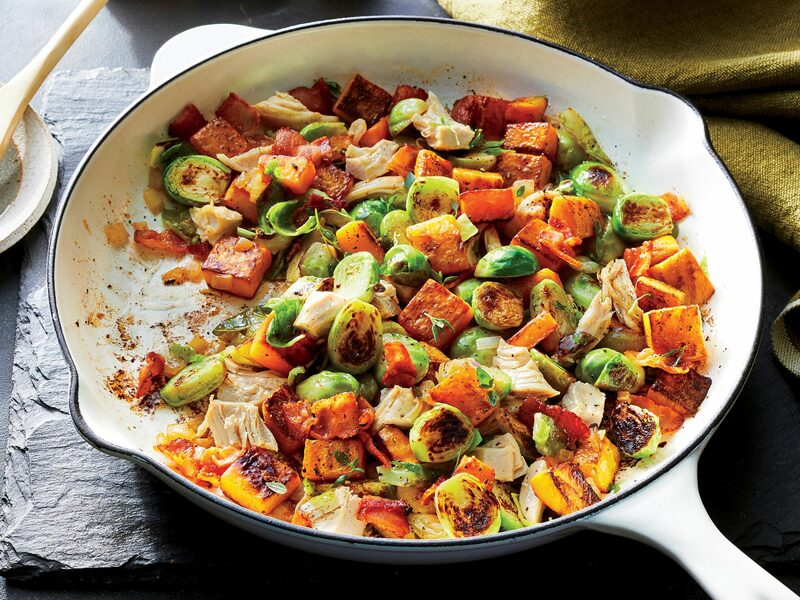 Packed full of bright citrus flavor, this dish makes for a perfect fuss-free weeknight dinner. Feel free to make the creamy yogurt dip in advance to speed up the prep on this fast and fresh dinner even more. Tangy Greek yogurt and fresh mint are a refreshing balance to the heat of a jalapeño, but to tame the spice a bit more, simply remove the seeds of your jalapeño before dicing and stirring into the yogurt. This recipe serves 2, but is easily doubled to serve more (or if you want to make sure you have leftovers). If you are using wooden skewers, be sure to soak them in cold water prior to grilling. “Milanesa” refers to a cut of meat that’s pounded very thin, breaded, and fried—in other words, it’s grade-A comfort food. 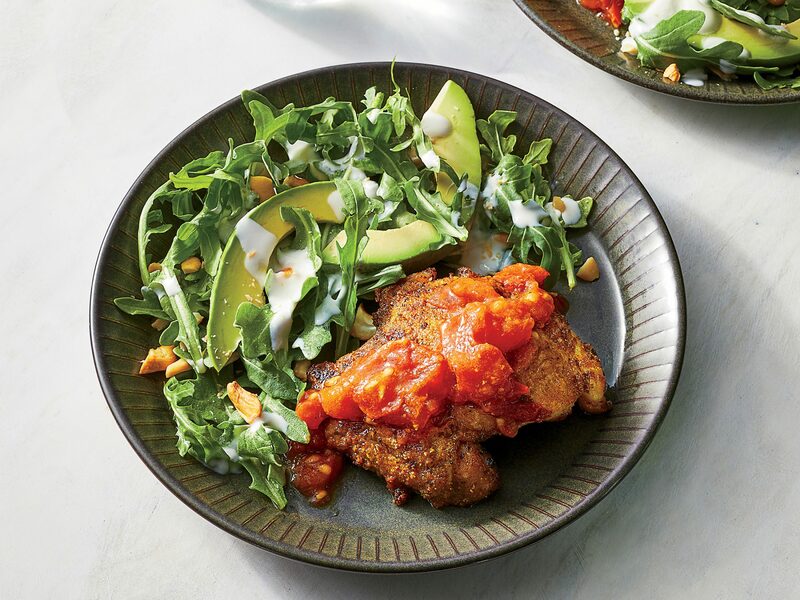 Here, we went with one of the more popular proteins for this traditional dish to make crispy chicken milanesa, and topped it off with a vibrant, fresh slaw for a pop of freshness and color. This flavor-packed red cabbage and jicama slaw is a great recipe to keep in your back pocket as it’d make a most excellent topper or side dish for any number of occasions—from taco night to your next big backyard cookout. If stroganoff could restore its Russian creators 200 years ago, this chicken version will restore you on any winter weeknight. These Italian-style sliders put a summery spin on Chicken Parmesan. Don't just quicken your chicken, give it a good kickin', too! Amplify zesty flavors with a citrus glaze for a fast 20-minute chicken dinner tonight. These sticky, saucy chicken thighs are perfectly paired with any grilled zucchini sides (shown here with chopped tomato-basil salsa). You can also use chicken breasts; just cook them a little longer, about 6 minutes per side. Lemon and honey are bright partners for the caramelized leeks in this 40-minute chicken supper. This pasta dish comes together quickly if one person grills chicken while another cooks the pasta and sauce. Garnish with basil sprigs, if desired. If you serve wine, a chardonnay complements the creamy sauce. If you can't find mozzarella pearls, dice a block of mozzarella. Comforting Roast Chicken with Sweet Potatoes and Apples is just the entree for feeding a hungry crowd. One large 5- to 6-pound bird or two smaller ones will satisfy your gang.